The Bulls may be getting a new patch to place on their uniforms, a picture of an M1 Abrams inside a circle with that diagonal line running top left to bottom right. Noah did again with his team best 13th double-double and exceeded five assists for the sixth time, the most among NBA centers. The Bulls sat up in their corner Tuesday and decided to come out for another round. No throwing in the towel for this team. No one’s quitting and no one’s had enough. Cut ‘em, Thibs. Cut ‘em. The Bulls in the wake of the latest loss of a leading scorer, this time the Monday night trade of Deng to the Cleveland Cavaliers for an expiring contract and draft picks some six weeks after Derrick Rose’s knee surgery, did their own operation on the hot Phoenix Suns. With Taj Gibson starting again for the injured Carlos Boozer and getting 19 points and 10 rebounds, Joakim Noah with 14 points, 16 rebounds and six assists, Jimmy Butler and D.J. Augustin with 13 each and Kirk Hinrich with a pivotal three-pointer with two minutes left, the Bulls defeated the Suns 92-87. 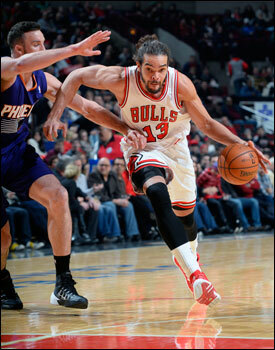 It was the Bulls third consecutive win and sixth in their last eight to raise their record to 15-18. The Suns led by Goran Dragic with 21 fell to 20-13. Whether the Bulls can maintain that remarkable commitment and consistency, holding the No. 1 transition team in the NBA to half their regular total with just 10 fast break points, will be watched carefully the rest of this season. Boozer is expected to return from knee soreness Friday in Milwaukee. Point guard Marquis Teague is expected to be recalled from the D-League, and the Bulls likely will have to add a 10-day contract player to meet the NBA minimum of 13 players after the Deng trade. The Bulls Tuesday effectively went with eight players as they rarely use rookie Erik Murphy. But they held the high scoring Suns to six of 23 on threes and one point above their season low scoring total. Perhaps at some point it will be too much to continue this defensive ferocity that has the Bulls back in the middle of the playoff race in the Eastern Conference at just two games out of third. The conventional wisdom, at least outside the Bulls’ locker room with the loss of Rose and the trade of Deng, was the Bulls would be backing up in the standings on the way to the lottery and a higher draft pick. But the players don’t seem to have gotten the memo. “That’s what this city loves about us,” said Butler, who shot four of 18, but made four big steals in a rugged 40 minutes. “We’re going to fight and we’re still expecting to win games and we’re going out to compete and no one can overlook us. That’s for sure. Noah drew another technical foul in his increasingly enthusiastic play, if that is possible. 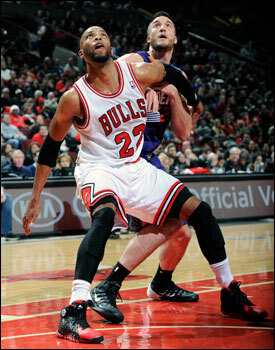 But he also continued to be a remarkable playmaker as the Bulls had a sharp 26 assists on 36 baskets. Augustin led the team with nine assists, the eighth time in the last 12 games he was the team leader in assists. Plus, it was his late penetration and pitch to Hinrich for the three that effectively sealed the game for the Bulls. That shot came after the Suns had drawn within 85-81 after trailing by 13 early in the fourth quarter following back to back Tony Snell threes and Noah’s rolling hook shot to open the fourth quarter. “It was a fun game,” said Gibson, averaging 14.5 points and 11 rebounds in his two starts for Boozer. “We were slinging the ball left and right, getting a lot of assists and a lot of easy baskets. We have an athletic team who can really get down the court. It was fun, Joakim leading the break at times. The Bulls had led much of the way, 27-25 after the first quarter behind Gibson’s fast start and then 49-46 at halftime as Augustin continued his exceptional play and Hinrich with a three to close the half on another Augustin assist. The two played together often, especially because the Suns play two point guards. But it’s a lineup Thibodeau indicated he’ll use more and welcomed by Hinrich, who often played off the ball in college. The Bulls took a 70-63 lead after three quarters with Gibson powering inside again and hitting his jump shot along with Snell, who finished with 12 points. Overall, the Bulls were a solid six of 14 on threes. But the Suns, who average 26 threes shot per game, came firing back from the perimeter and with Dragic maneuvering inside to get within four with 2:13 left. That’s when Augustin got deep in the paint and fired back to Hinrich on the right arc for the three to give the Bulls an 88-81 lead. Though guard Ish Smith scored on a 16 footer, Butler made another steal. Then as the Bulls went cold, Noah with about 40 seconds left sealed off Plumlee trying to maneuver inside and Butler again dislodged the ball and the Bulls made free throws to end the game. It was quite the defensive duo along with plenty of help from Gibson. Thibodeau also had praise for Butler. That seemed to be the question facing these Bulls. Could they still with another teammate gone, especially one who was relied upon so much and was a father and brother figure to many. 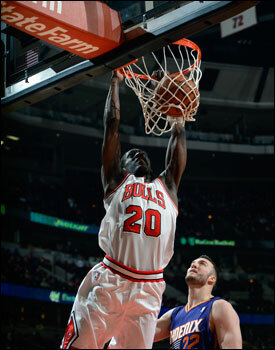 Deng led the pregame chant of “Bulls on three” of taking the players out to the court. Hinrich said there was an awkward silence before Butler stepped in to voice the ritual and take the team out. Butler said the two spoke after news of the trade hit. It was a lot of the “how does it feel stuff” from reporters, and the players didn’t feel all that great about the Deng trade. It was an emotional day and night for the players from the morning shootaround with a big media turnout to a press conference with executive vice president of basketball operations John Paxson and the questions being hurled at them about what this all meant. But then they finally got back on the basketball court and it seemed right. We’ll see in these upcoming weeks what kind remains.